Located in the heart of historic Dublin city, this hotel overlooks the Kilmainham Gaol Museum and is surrounded by some of Dublin's premier attractions. 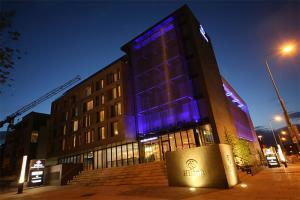 The hotel is just moments away from the Dublin Zoo, Royal Hospital Kilmainham, Guinness Storehouse and much more. Accommodations are modern and spacious, with many rooms providing panoramic views of the city and the adjacent parks. Located in Dublin, Ireland, about 7 miles from the airport.